The Krampus 2015 Spirit Badge came with our KRAMPUS COLLECTION Kickstarter. This badge will not be offered for sale (it was an exclusive for this Kickstarter), though it could be traded from one Monster Rangers to another. There is no passphrase for this particular badge, since it is a reward for being fantastic and supporting our campaign. There is 1 level of the Krampus 2015 Badge. 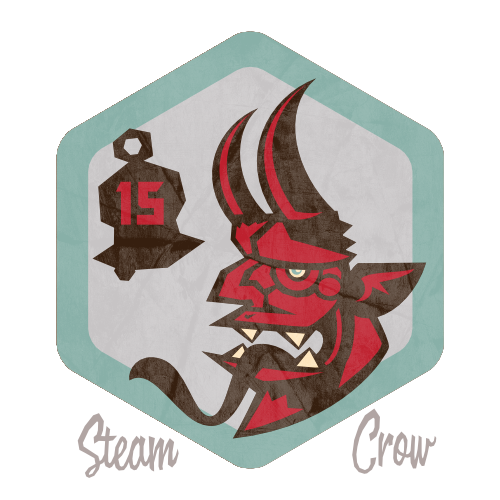 Steam Crow has made Krampus an annual tradition, with a shirt, print or some other release for the last several years. Daniel was pretty excited when he first learned of the Krampus (a Christmas MONSTER?!!) several years ago. The Krampus symbolizes the risk of being naughty in life, and the punishment that is surely coming. This is a Rare badge, with just over 200 distributed.